Get your vegan business started and let your story unfold! This package includes everything you need to get up and running—logo design, business cards, and website design or redesign. Includes two rounds starting with original concept, client tweaks, and final design. Final files include a vector logo (essential for print) with two variations—color and grayscale. Digital logo for web and social media included. 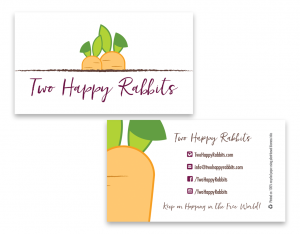 Cards designed with new logo. Choose one- or two-sided cards. Option of using a vegan printer. Option of partially- or fully-recycled paper.